I am sure that you would be sometime using your desktop or laptop with other people too. This mainly constitute your family members or your friends ( occasionally ). Obviously you would like to maintain your privacy and don’t want your personal stuff to be revealed to everyone. The most easiest way is to have your own individual account in your operating system. This would completely separate your info and data from other members accessing your shared PC. This also gives you right to alter permissions on sharing of data between users. You would definitely want to have a password for that account to avoid people sneaking in your profile. For keeping your web browsing secure and private , always use private browsing in Firefox or IE or Incognito Window for Chrome. All your browsing history,session details and cookies etc. are automatically deleted as soon as you close the window. You would definitely not want your sensitive ( or may be inappropriate ) search term used earlier to be visible to everyone. This would prevent others from knowing what you had earlier searched in browser. For a quick cleaning of history details, cookies, temporary files etc, use CC-CLEANER which is a free tool to help you clean the junk from your computer including your history details too. Just in case you skipped any of above steps, you can use this to clean your history sessions of browser. 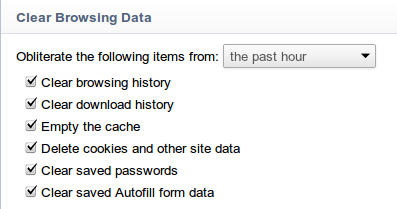 Clean and remove all the previous cookies, browsing history etc. from your PC regularly. If you want to keep your files secret and invisible to others then use the free software called True Crypt which encrypts your files so that no one can access them without a password. What more, you can even make them hidden to avoid suspicious eyes of your family members.